Analysis of carbon (C) in soil has been successfully made by laser plasma spectroscopy using a pulsed carbon dioxide (CO2) laser. Fine particles of soil sample were attached on a surface of the metal subtarget by adding a small amount of moisture; the metal was used to initiate the gas plasma. Experimentally, a pulsed laser was focused on the subtarget to induce a luminous plasma. The particles were vaporized and entered the plasma region. Dissociation and excitation happened in the high-temperature plasma region. The result certified that an analysis of C in soil can be demonstrated. A further measurement revealed that a calibration curve of C was successfully carried out. The limit of detection of C in the soil was around 23 mg/kg. 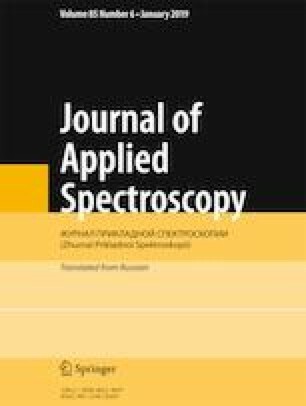 Abstract of article is published in Zhurnal Prikladnoi Spektroskopii, Vol. 86, No. 1, p. 158, January–February, 2019.